To my European friends, this is a true story. Not fake news. True. You really couldn't make this stuff up. No one would believe you. Republican Governor Christie is in a budget battle with his Democrat-controlled state legislature. They are at an impasse. Without a budget, government services not considered vital are shut down and the staffs are furloughed. Among those services/staffs affected are those associated with New Jersey state parks. Yes, it appears as though state parks in New Jersey will be closed for the 4th of July holiday. And that includes state beaches like my particular favorite, Island Beach State Park. How out of touch can New Jersey politicians be, closing beaches during one of the most awaited summer vacation weekends of the year. Out of touch? You ain't heard nothin' yet. How about this? 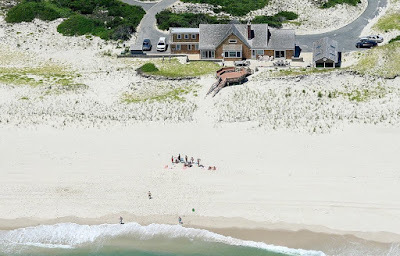 Governor Christie, not about to have HIS family's vacation ruined, piled his clan into a state helicopter and spent Sunday afternoon on one of the closed beaches. Yes. Island Beach State Park. Because he can. It's good to be King. Or at least, it's good to be a politician to whom the rules for the rest of us do not apply.